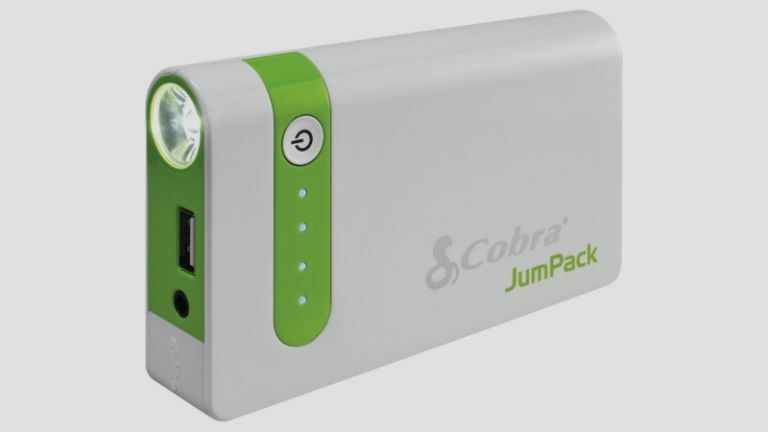 US tech firm Cobra Electronics has launched the Cobra JumPack, a portable charger for your mobile devices that doubles up as a jump-starting juicebox for your car. The Cobra JumPack makes use of a hefty 7500 mAh Li-Ion battery that puts out a starting current of 200A, plenty to get your motor running. “Through ingenious design and engineering, Cobra took the traditional powerpack device and completely redesigned it, confining a powerpack to just a few square inches,” says Sally Washlow, president of Cobra Electronics. The portable device sports an LED battery status indicator, and also comes packing a built-in LED flashlight with strobe and S.O.S functionality - perfect for both roadside emergenies or impromptu raves. The JumPack ships with jumper cables, and can be charged either through your plug sockets at home, or with the 12V car charger on-the-go. "Now consumers can rely on a product that will keep them powered up at anyplace, anytime," writes the firm. The Cobra JumPack is available from Amazon right now for $129.95, but be warned - the mains charger is designed for US plug sockets, so you'll need an adapter, otherwise you're stuck using the 12V car charger.